I have a bit of Easter envy. It is one of the occasions in the course of the year that I feel openly mocks the lack of female members in my family. There are so many aspects of the Easter ensemble that just don’t translate into the male perspective. The Desrochers household has an entire lack of Easter bonnets, mary janes, crinoline, and lace edged socks or rumba tights. To combat this I subject my men to what my sister summarizes as being living Gap ads once a year. 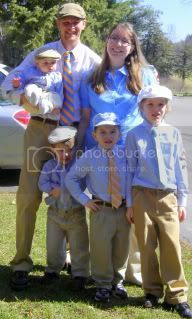 Each and every Easter the outfits have a theme that everyone must succumb to. Tell me a year, I’ll tell you the theme. 2007, brown with the occasional blue stripe comprised mostly of polo shirts. 2005 everyone wore striped shirts, all of the boys in blues and I wore pink. This year it was blue shirts, striped ties and pageboy hats. I loved it. I think they looked great. I wore a blue shirt too, but the hat and tie thing didn’t really apply to me. Now I realize Easter has nothing to do with outfits. We celebrate the Resurrection of our Lord in many ways with our family. We prepare, we read the story, we sing songs of jubilation in the Easter morning service. I was blessed this year that the three older boys sang in a children’s choir at church that morning. I loved watching them shout “Hosanna” and jumping up and down. It was a wonderful way to mark the day. But maybe my carefully planned Easter morning picture each year has more to do with creating our own family album. Of having a reminder of each of those special years and where each of them are at at that given moment. Not only can I mark the year’s in the photos, I mark them in vivid memories in my mind. And in many, many ways it reminds me of the pile of photos my Aunt Nancy has marking my father’s generation of children, and even the one’s of my Grandfather’s childhood, all lined up in Sunday bests posing for photos on the streets of Philadelphia. Oh my gosh, how adorable are you guys! I’m going to have follow your lead and start dressing up my husband and baby, too! Coming over from MBC under 100. You have a beautiful family!! I’m now following you.